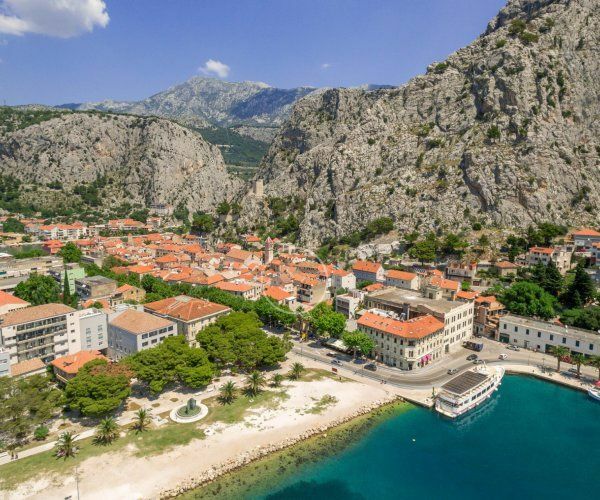 The house is located in the centre of the medieval town of Omis, near the tower called Torjun. It was created by consolidating two residential houses, one leaning on the medieval defensive wall and the other placed towards the wall forming that way an intimate courtyard. The houses are characterized by harmonious Baroque carved details and some of the best features are the main portal and a beautiful console stone staircase with balcony in the courtyard. The house was completely renovated in 2010. Sitting under an ancient defensive wall and the possibility of walking the defensive wall, which can be accessed from the apartment on the second floor, represents a special attraction. The house has its own backyard, yet when stepping from the Baroque set you find yourself in the historical town centre with a variety of restaurants and shopping facilities. You will be even more delighted when you realize how close the villa is to the sea and a long public beach that stretches to the nearby cape.